This three- tiered waterfall of chocolate makes the perfect addition to any gathering! 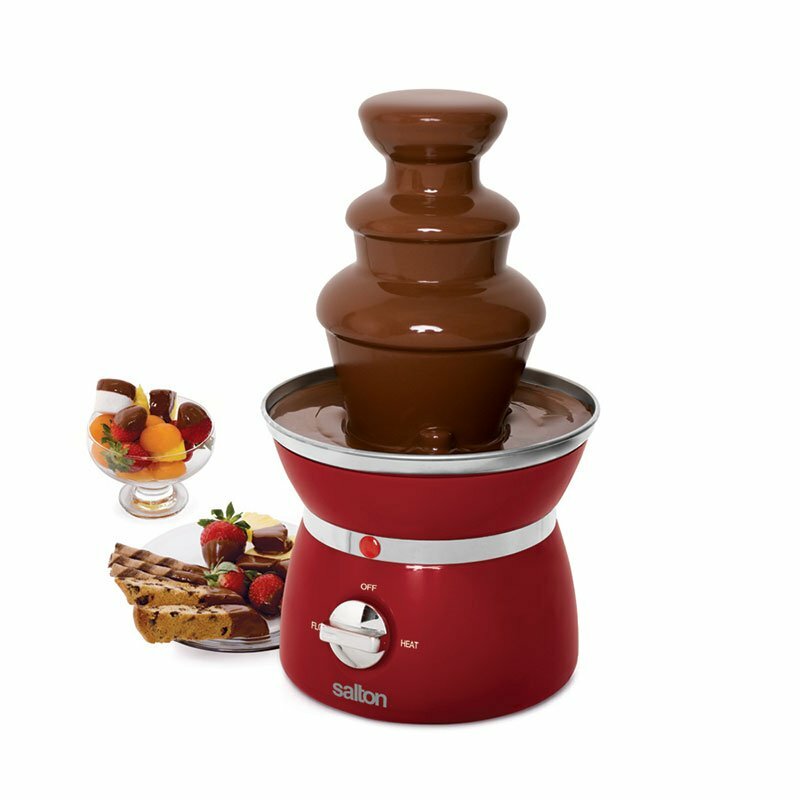 Melt up to 700 grams of white, milk or dark chocolate and serve your guests delicious desserts. 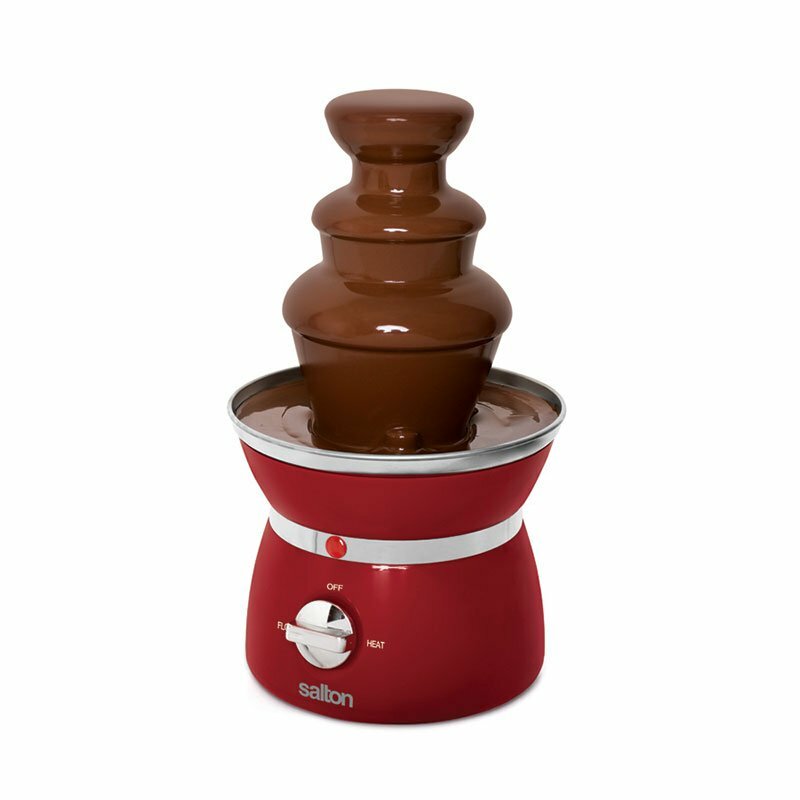 The tower can be disassembled for easy cleaning and the flow of chocolate begins with the flip of a switch. That’s entertaining made easy! The ultimate way to cook bacon! 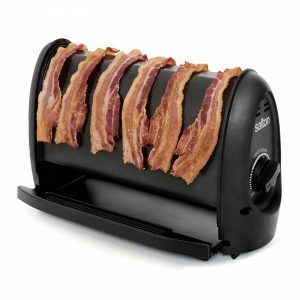 The Bacon Maker cooks up to 6 slices of bacon in minutes and drips away the fat for the perfect taste and crispiness. 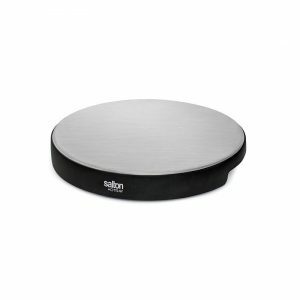 The removable drip tray and stainless steel cover are dishwasher safe for easy cleaning. Cooking bacon has never been this easy! Create fluffy, melt-in-your-mouth cotton candy from the comfort of home! Use your favorite hard candies or flossing sugar to create fluffy cotton candy the whole family will love. 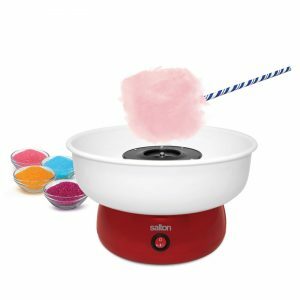 The clear rim acts as a protective guard and allows for easy viewing of the cotton candy while its being made and suction feet provide stability making it safe for the whole family to use! The unit quickly disassembles for easy cleaning and includes a sugar scoop and 8 reusable sticks. Gather up your friends and family for a mouth-watering raclette get together! Grill fish, chicken, sausage and vegetables on the top grill, while the cheeses melt beneath in the 8 non-stick, color-coded pans. 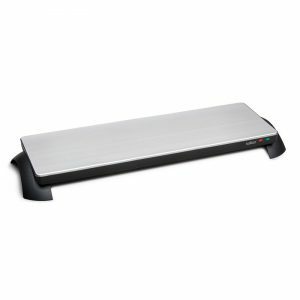 Equipped with 8 spatulas to remove the food, this easy-to-use and easy-to-clean raclette will bring people together over delicious food. 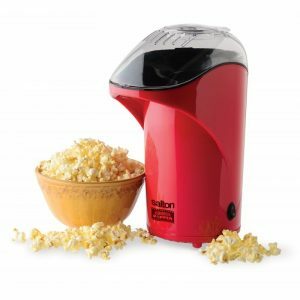 Always be ready for movie night with Salton’s Popcorn Maker. The airflow design pops kernels faster than other serving methods and it uses no oil ensuring a delicious low calorie treat! No more need to go to the movie theatre to enjoy a fresh batch of cinema style popcorn. 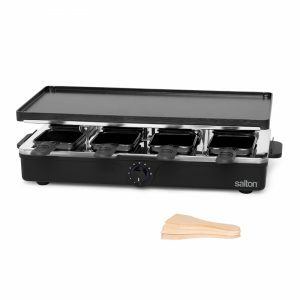 Expand your Salton dehydrator with additional trays! 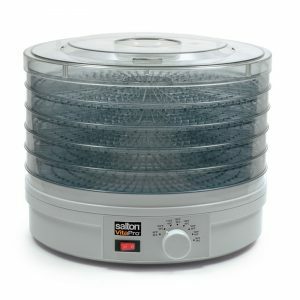 Pack includes two Reusable BPA free dehydrator trays. Compatible trays fit dehydrator models: DH1246, 1273, DH1454 and DH1460. Tired of reaching for your favorite snack only to find out it’s stale. Look no further! 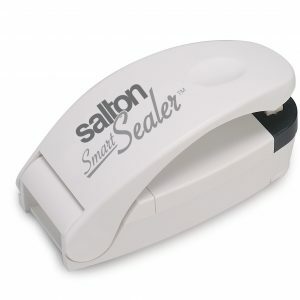 The SmartSealer uses battery power to heat and seal in the freshness of your favourite snacks. The handy magnet on the back ensures it is always within reach when you need it, and the convenient built-in bag cutter opens up the sealed snacks. Never eat a stale snack again! 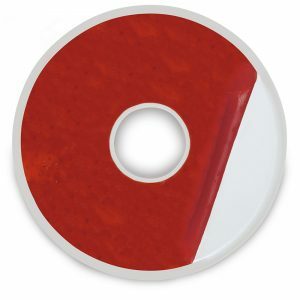 Pack of 2 Reusable BPA free fruit roll up tray liners. 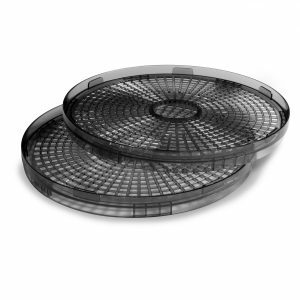 Compatible trays fit dehydrator models: DH1246, 1273, DH1454 and DH1460. Make your own healthy fruit roll ups without added preservatives. 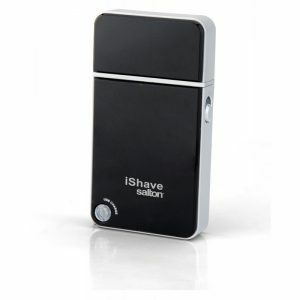 Never leave home without your iShave! This travel size companion is no bigger than an iPhone and is USB rechargeable, cordless and compact. Able to run 35 minutes on a full charge and shaves much closer than most other electric razors. You will always look your best as long as you have your iShave with you. Don’t feed cold hors d’oeuvres to your guests again! Whether you have a family gathering, throwing a party, or are gathered around the TV for some quality time, the Cordless Warming Tray will make sure your food stays warm. Simply plug the warming tray in for 8 minutes to enjoy warm food for 60 minutes. 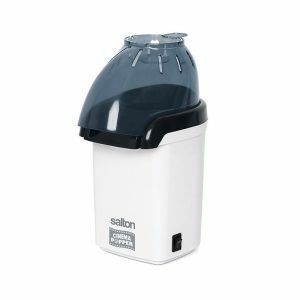 Always be ready for movie night with Salton’s Cinema Popper. The special airflow design pops kernels faster than other methods and eliminates the need for oil resulting in a delicious low calorie treat! No more need to go to the movie theatre to enjoy a fresh batch of cinema style popcorn. Who said S’mores were for Summer? 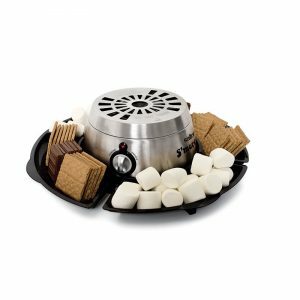 With the S’mores maker you can make your delicious treats indoors all year round. The heating element has no open flame so there’s no need for a campfire! The serving tray has enough compartments to fit all your s’mores kit ingredients and conveniently includes 4 roasting forks. Gather up your friends and family for a mouth-watering Raclette get together! 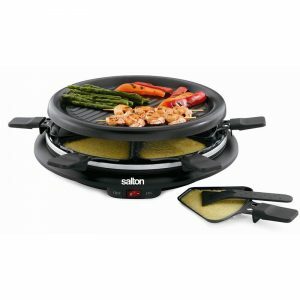 Grill fish, chicken, sausage and vegetables on the top grill, while the cheeses melt beneath in the 6 non-stick pans. 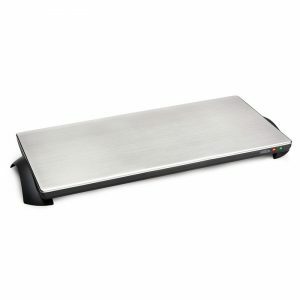 Equipped with 6 spatulas to remove the food, this easy-to-use and easy-to-clean raclette will bring people together over delicious food. Pack of 2 Reusable BPA free herb tray liners. 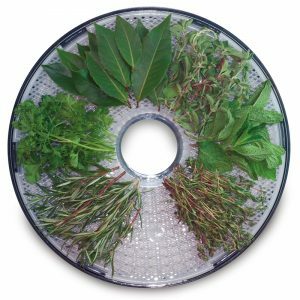 Perfect for drying herbs, flowers, fruits and more. The easy and economical way for drying fruits for snacks, vegetables and herbs for soups, meat for jerky, bread for croutons and flowers for arrangements or potpourri! 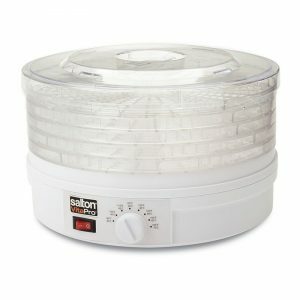 The Salton Food Dehydrator has adjustable heat control and a quiet motor which circulates the air, eliminating the need to rotate trays. Includes 5 collapsible trays, 1 fruit roll-up tray, 1 herb tray and vented lid.